Evy played in her first official soccer match today. She had a lot of fun being part of the green team. She ran around a bit, kicked the ball a few times, ate some of the halftime snack and cheered for her teammates. Evelyn was concerned about one thing - the condition of the pitch (and the condition of her cleats). It was pretty muddy out there. Maybe her aggressiveness, competitiveness and goal scoring prowess will be awakened with a drier field and some nicer weather next weekend. 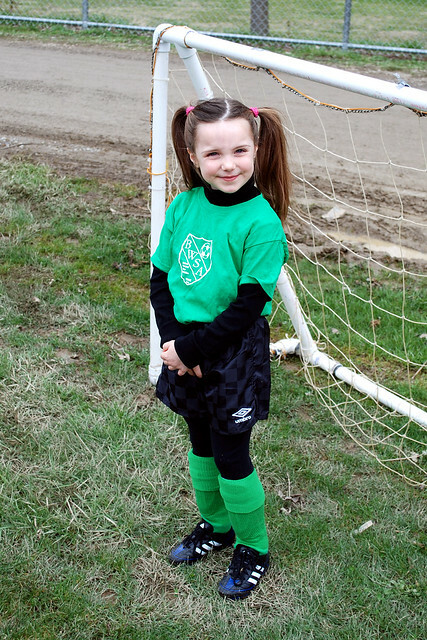 More from Evy's first soccer game is on Flickr.